This is part II of a two part series on views I’ve written, you can see part I here. 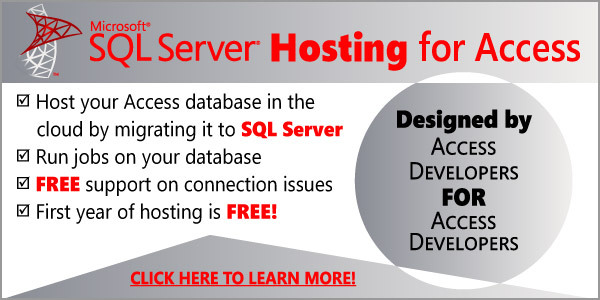 Over the last couple of years I have had a great deal of experience with working on Access Databases with the Data is linked to tables in stored in SQL Server. With relational databases and lookup tables you can easily end up with a view that contains multiple numeric columns which just hold the primary key from other tables. Say for example you have a database with two tables: one for company information and another just for contacts, but you need to link your contacts with companies and you have situations where a contact is linked with multiple companies. You can easily manage this by creating a third table of CompanyContacts which would be rows of data containing CompanyID and ContactID. There are many situations where you would have a similar table that is linking data from one table to another but these tables need to be maintained and and managed by users who really need to see the underlying data and not just the ID’s. To resolve the issue you can create a view with all the needed tables and base your form on the linked view, but you will quickly notice you can’t edit any data, it’s all read only.